As popular as online email services such as Gmail are, they are far from being as convenient as dedicated desktop email clients. With a desktop email client, you can enjoy more features, such as offline access to your emails and contacts, excellent integration with the rest of the operating system and other software applications, and more. Mac users have it particularly great when it comes to desktop email clients because there’s a lot to choose from. In fact, some may find the sheer selection of Mac email clients overwhelming. How do you know which email clients for Mac you can trust with your personal and business correspondence? Our list of top 10 best email clients for Mac is here to help you. Before we get to our list and tell you what’s the best email app for Mac, we want to say a few words about email recovery. Perhaps due to the huge amount of spam the average computer user receives every day, people often take for granted just how much invaluable information emails contain. From login credentials to bank account statements to business correspondents to private conversations with loved ones — emails are the unbound memoirs of our modern lives. You should create regular email backups and store them as safely and securely as possible. It’s a good idea to automate the backup process so you don’t need to think about it all the time and still be able to rest assured knowing that you have up-to-date copies of all your emails. But sometimes even an automatic email backup solution isn’t fast enough to create backup copies of your emails before your hard drive decides to give up or you become a victim of a malware attack. In that situation, your only hope is a data recovery software solution like Disk Drill. Disk Drill features state-of-the-art data recovery software algorithms capable of recovering lost emails from all storage devices. Disk Drill is a user-friendly solution with an interface design worthy of the macOS operating system. Go to Disk Drill’s website to download the software for free to see how it works for you. Apple Mail, also known simply as the Mail app, is the default email client on macOS. As is characteristic for apps from Apple, the Mail app is a simple, polished piece of software designed to streamline your email conversations and make your life easier with search filters and support for multiple email accounts. Since macOS Sierra, the Mail app supports Siri, allowing you to have Siri read your emails to you. You can also tell the intelligent personal assistant to send a quick email for you. The Mail app is intuitive, capable, and it’s right instantly available on every Mac computer. Unless you have very specific requirements which the Mail app doesn’t meet, we don’t see a reason to use a different email client. It’s no surprise that the best Mac email client comes from Apple. We understand that for some of you, Microsoft Outlook will be forever associated with email viruses, corporate memos, and some of the worst examples of interface design clutter. Microsoft is aware of the unfortunate image of its email client, and the company is actively trying to change it. Outlook 2016 was the best email client for Mac 2016 in the category of business email clients, and it has ended in the second place overall this year. 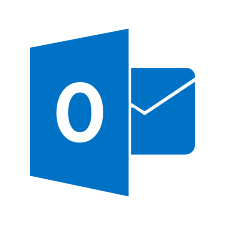 Outlook’s user interface is getting better with each year, and no other email client comes even close when it comes to the broad range of features Outlook offers. From the ability to manage multiple inboxes to the all-in-one calendar management feature to the fantastic integration with Microsoft Office — Outlook is the undisputed king of business email clients, and it’s also a great choice for Office 365 users who are looking for extra features and fantastic reliability. Even though Mozilla no longer actively develops Thunderbird, this free and open source email client is still one of the best email clients for Mac. The first version of Thunderbird was released in 2004, receiving more than 1 million downloads in the first 10 days of release. Thunderbird is more than an email client; it’s a personal information manager with an RSS reader, IRC chat, extensions, and sophisticated email filtering capabilities. Thunderbird users love the ability to make Thunderbird exactly what they want it to be just as much as they enjoy the fact that Thunderbird works great right out of the box. Because Thunderbird has been around for such a long time, the application is highly polished, and virtually free of bugs. Postbox is a perfect email client for power-users who desire customizability, elegant design, and powerful features. The biggest problem that users face when dealing with emails is figuring out an effective way how to separate important emails from marketing spam. Postbox has an email categorization system that feels instantly familiar yet does things just a bit smarter than other email clients. If you spend a lot of time every day writing the same email responses over and over again, you will like the 70 professionally written email templates that come with Postbox for free. The templates have customizable placeholders for names, job titles, dates, and other things, allowing you to dramatically reduce the time you spend doing things you don’t enjoy so that you can spend more time doing the things that make the biggest difference. Nylas Mail is a free, open source email app for Mac, Linux, and Windows. When you first open Nylas Mail, you will be greeted with a setup wizard window that will allow you to easily add any of your email accounts. You can choose between a Gmail-like view and an Outlook-like view with a side panel. Regardless of which view you choose, Nylas Mail will surprise you with its excellent email composition panel and enriched contacts. An email address with the name of the person behind it doesn’t tell you much, unless you already know the person. That’s why Nylas Mail automatically gathers all relevant contact information from social media websites and sites like GitHub and makes it instantly available so that you can better distinguish important emails from those that can wait just a while longer. Airmail is a winner of Apple Design Award, and it’s not hard to see why Apple picked it. While most email clients, even those that claim to be innovative and modern, stick with the same layout that has been around since the early days of Microsoft Outlook, Airmail does things differently. The app was designed from the ground up to allow users to process their emails without interruption, regardless of whether they have only a single email account or a dozen. Airmail supports all popular online email services, it features per account notifications, offline email access, custom global shortcuts, cloud storage support, and more. Are you overwhelmed by the huge number of emails you get every day? Then you need an email client that will help you get through them quickly and painlessly. Spark features a smart, unified inbox that collects all your emails and automatically categorizes them for easy processing. Spark also supports smart notifications, widgets, integration with other services, and much more. Use it on your MacBook, iPad, or iPhone. Polymail is more than an email client; it’s a sales platform with support for email analytics and personalized email campaigns to multiple prospects at once. Polymail seamlessly integrates with Salesforce, and you can easily connect it to all popular online email services. Polymail uses the pay-as-you-go payment method, starting at $10 a month for the Pro edition. Teams who want to take advantage of Polymail’s collaboration features can either pay $16 a month per user for the Teams edition or $49 a month per user for the more capable Enterprise edition. Canary Mail is a beautiful email app for Mac and iOS with two themes and customizable keyboard shortcuts. But Canary Mail actually isn’t just about design and usability; it’s also about security and privacy. Canary Mail offers PGP encryption out of the box, allowing you to encrypt all your email conversations with the same encryption that allowed Edward Snowden to hide his communication from NSA. But unlike the tools used by Snowden, Canary Mail makes PGP encryption highly intuitive. If you think about it, traditional email clients behave in a very unintuitive way. Even though most people exchange emails with a relatively small number of people, emails are either grouped into conversations based on the email subject, or they are not grouped at all. Why not group emails by the sender just like text messages? That’s exactly what Unibox offers. This email client allows you to concentrate on the actual communication with the people you know, instead of forcing you to waste time on email management. 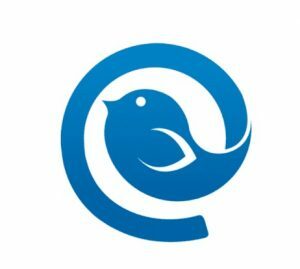 Mailbird is a mail client for the Windows operating system. It is a powerful tool whose elegant design would not look out of place on a Mac. Within the first five minutes of use, you will feel at home with its intuitive interface and start to manage your email in a more efficient way. Mailbird is packed with features that allow you to streamline the way you handle your email and contacts. Combine all your email accounts into one unified inbox to simplify your day and take advantage of the built-in apps to integrate with Facebook, Twitter, Dropbox, and many other sites. An integrated speed reader helps you quickly review your inbox and you can snooze messages that you may want to give more attention to at a later time. You can customize your Mailbird experience with a wide variety of color themes and custom sounds. 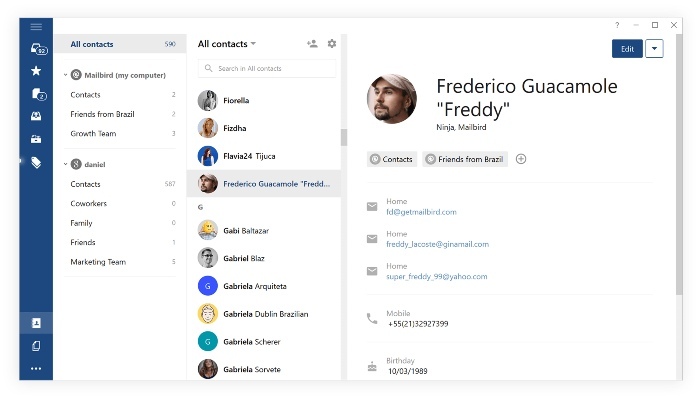 The application includes a powerful attachment search feature as well as a direct connection between your contact list and inbox. Free 24/7 email support is offered and Mailbird supports 17 languages from across the globe. You can download the Lite version of this app for free which supports all common servers and the contacts manager. Upgrading to the Pro version makes all of the features available.